Hello! We’re sorry that we’ve been neglecting our website and our journal page these last several months. First we were busy finishing up the new Family Guest House project, and then trying to catch up on other projects also neglected during the construction … And now we are re-creating our website with the help of the folks at Anchor Wave! We are hoping to have the new site ready for launch by the end of the summer. So stay tuned! In the meantime, here’s a summary of the last few months. The new Family Guest House was completed by the end of April, just in time for visitors from our Order to stay there. 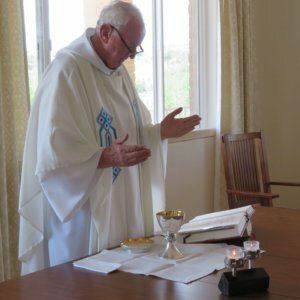 On May 31, the Feast of the Visitation of the Blessed Virgin Mary, we celebrated a Mass of blessing in the new house. 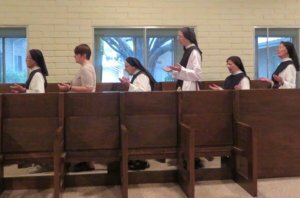 We kept it simple with just us Sisters, our friend Msgr. Tom Cahalane of Our Mother of Sorrows Parish, our contractor Dave Mellgren of Mellgren Homes, his son and assistant Michael Mellgren, our architect Hank Krzysik and his daughter, and a couple of women retreatants. In his homily during the Mass, Msgr. 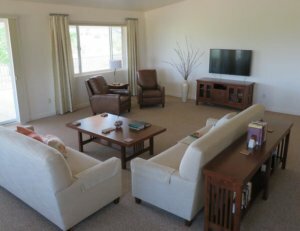 Tom spoke of how both this new guest house and the retreat house are like an extension of our cloister in the sense that we Sisters share something of our contemplative life through the hospitality we are able to provide in our guest facilities. 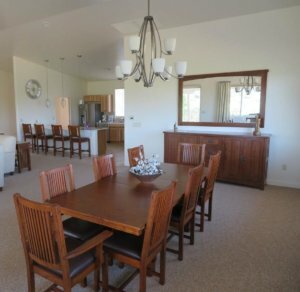 The new family guest house is so beautiful, peaceful and spacious. We’re getting rave reviews from those who have stayed there so far. The house is primarily for the Sisters’ visiting families, but will also be used for other special guests such as visitors from our Order. 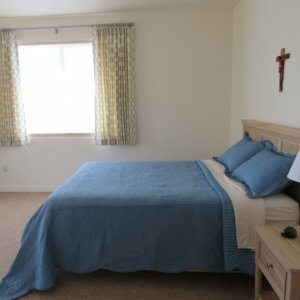 We offer our heartfelt thanks to God and to all who contributed to our beautiful new family guest house, most especially the monks of the Abbey of Our Lady of the Holy Trinity, the Raskob Foundation, and all our friends and benefactors who support us in so many ways! See below for more photos! 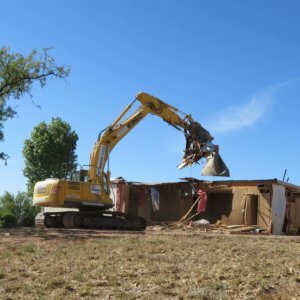 Meanwhile, earlier in May the old trailer family guest house was demolished. In preparation, a team of four sisters pulled everything out of all the cupboards and closets–it’s amazing how much stuff can accrue even in a guest house over the course of 46 years! All this had to be sorted into three piles: Keep, Share, and Trash. We did the same discernment with all the furniture. When we were ready, our friend Dennis Cozzetti and three of his employees came and moved out all the furniture. They took some of it down the hill to the retreat house to replace worn-out items there. Most of the rest we took in a 3-truck caravan to Pio Decimo Outreach in Tucson for their ministry to seniors and to homeless families. Thank you, Dennis and crew! We could never have done all this without you! The demolition crew came a couple weeks later and began taking apart the old trailer. This was done in stages so that the various materials (brick, concrete, metal and wood) could be separated for recycling. The trailer itself was too old (built in 1970?) for re-use, so recycling was the next best thing. In the process, of course, of course, the water line was broken (but only twice!) and the phone line to the chaplain’s house was cut (oops! ), but all was taken care of in due course thanks to Dave Mellgren and his crews. Next up was landscaping around the new guest house and over the site of the old trailer. 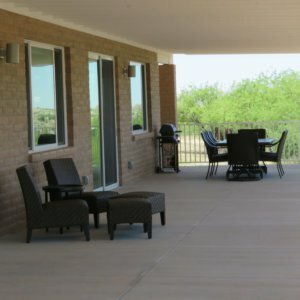 Ken Karrol of Diamond JK Nursery in Sonoita did a beautiful job with a variety of appropriate plantings in a bed of gravel close around the house. Jim Koweek of the Arizona Revegetation & Monitoring Co. came and planted native grasses everywhere else. New dark sky LED lighting was put in for the retreat house parking lot (replacing the old floodlight which had been attached to the trailer). 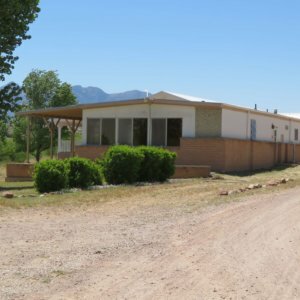 Now underway are the finishing touches: a crew from Cimarron Circle Construction is extending the existing retreat house pathway out to the road and to the parking area, and is renovating the existing pathway down the hill. 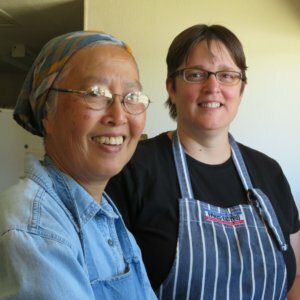 Our Volunteer Helper Program is in its third summer. This year we’ve had one volunteer so far, Janell, who took advantage of the program to help in her journey of vocational discernment. First she lived at the retreat house for several weeks like all our volunteers do, praying with us from our guest chapel and helping us with our work around the monastery and retreat house. Janell’s next step was to come inside the enclosure for what is called an observership. During an observership, a candidate to our community lives inside the monastery, attends the Divine Office and Eucharist with us in choir, has classes with the novice mistress, meets with the vocation director for discernment, and continues to work with us wherever needed. After a few weeks, Janell discerned that she was called to a more active way of life. She loved being here and we loved having her! We are keeping her in our prayers as she continues her journey. May the Lord bless and guide her! Our friends Clay and Marcia Landwehr were back here again this summer. Clay has a life-long love of woodworking and is a good handyman all around. He and Marcia did a number of fix-it jobs at both the retreat house and the monastery during their stay. 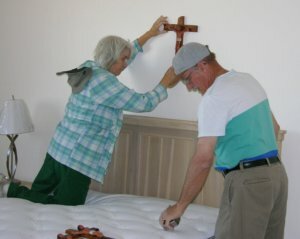 In the photo they are at work hanging up the beautiful mesquite wood and clay crucifixes which our Sr. Esther crafted for each of the bedrooms in the new guest house. Thank you, Clay & Marcia!